An online master of business administration (MBA) is widely believed to guarantee wider career options, more opportunities for promotions, and greater job security. If you pursue an MBA online, you'll explore many types of management positions in a range of fields such as operations, construction, human resources, and public relations. An MBA will train you for high-level positions in these fields by teaching you practical skills; you don't need to hold an undergraduate business degree to pursue an MBA. Students of online MBA programs graduate with advanced degrees that lead to increased job opportunities. The Bureau of Labor Statistics (BLS) projects that the number of job openings in the field will grow by 6% from 2014-2024, with more specific MBA-related fields growing at even higher rates. Furthermore, job candidates with MBAs on average earn $45,000 more per year than their bachelor's degree-holding counterparts. By completing an MBA program online, you can earn an advanced degree at an affordable price and from the comfort of your own home. There's no need to disrupt your busy work or family life to further your education. 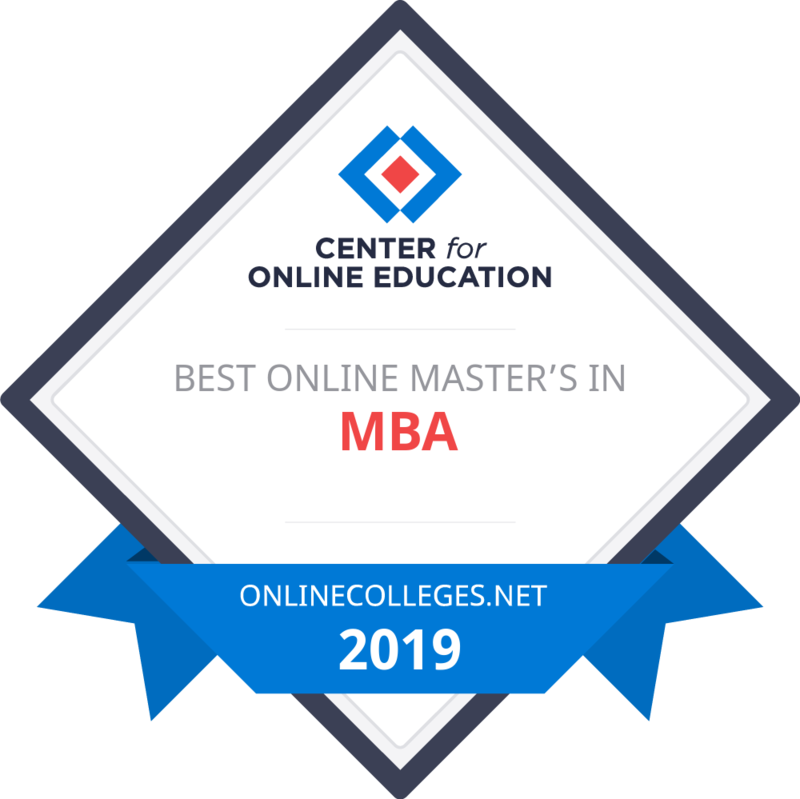 Read on to learn more about the careers you'll be eligible for after earning an online MBA degree, and the added advantages of executive online MBA programs. Earning an MBA online can help you significantly advance in your career. Not only are MBA-holders qualified for increased salaries, but the flexibility of an online degree allows professionals to work as they learn, making online MBA programs wise investments. Even though MBA programs online offer tremendous flexibility, a full-time online MBA may still require more time than you can fit into your busy schedule. That is why many universities also offer part-time MBA programs online. Both full-time and part-time programs will take you through the same curriculum, but a part-time program allows you to pace yourself by taking fewer credit hours per semester. Full-time online MBA programs may be completed in two to three years, whereas completing your part-time MBA online may take three to four years. Harvard Business School’s cohort-based online MBA program for leadership development (PLD) is designed for experienced, knowledgeable, high-potential busy managers and specialists with over 10 years of experience. It’s an accelerated executive MBA alternative that can be tailored to meet individual needs, personal interests, and unique challenges. Students study through four modules. Two are taught on-campus (cross-functional business approach and leading change) and two are offered off-campus (foundational skill building and strategy formulation and implementation). Students have the option to complete a fifth, optional on-campus module on personal leadership. Modules enable students to meet and interact with researchers and award-winning authors. Through peer-to-peer learning, a collaborative coursework structure, and one-on-one professional coaching, Harvard PLD students gain in-depth knowledge of foundational business functions, examine new methods and technologies, build strategic and effective decision-making and strategy-development skills, and develop a strong personal leadership philosophy. North Carolina offers an interactive, world-class education with face-to-face classes and one-on-one support from professors. With six concentrations available, students can customize their online MBA programs to meet individual academic and professional interests. The degree was designed as a flexible and collaborative MBA program. Students are admitted in small cohorts in January, April, July, and October, and classes can be taken full-time or part-time. UNC uses Sakai to facilitate its distance-learning program. Students are required to attend two, in-person Global Immersions, where they travel to major business centers and interact with industry leaders and network with professors and peers, enhancing their cross-cultural awareness. Learners are also required to take part in virtual meetings. Upcoming 2017 immersions include Johannesburg, South Africa, and Mumbai, India. Completing one of the best online MBA programs at UNC enables students to become strategic and analytical problem solvers and exceptional business leaders. Florida offers an innovative MBA program with two online options. Within the two-year online MBA programs, students take core classes in finance, marketing, management, operations, and economics. The accelerated one-year program allows experienced business professionals to skip core classes like accounting and macroeconomics, and take advanced electives after a one-week, mandatory review class that follows orientation. Students enrolling in electives choose between a week-long, on-campus intensive class or a Global Immersion Experience, in which students participate in a one-week international study trip. This program does not require students to hold a business degree. UF utilizes the latest technology to create an interactive learning experience. UF’s MBA program offers a flexible online format integrated with mandatory, on-campus face-time with faculty and peers every four months. Social events with other MBA cohorts are also available, enabling students to build a powerful network. Class sizes are limited to 65 students, ensuring quality interactions between students and professors. Virginia’s Global MBA for Executives combines high-engagement distance-learning experiences, monthly on-campus requirements in Charlottesville or District of Columbia, and an international residency. Monthly, in-person residencies, typically held on the weekends, include action-oriented discussions and presentations, which strengthen students’ professional networks and community. The online MBA has students engage in two intensive week long leadership residencies in Charlottesville, providing access to fresh management perspectives through workshops and coaching. Learners are required to participate in at least one global experience in China, Europe, India, or South Africa. The international residency gives students the opportunity to broaden and diversify their perspectives. Students are organized into learning teams, allowing collaboration between faculty and peers by sharing screens and content, writing comments and questions in real time, participating in conference calls, and watching previously recorded videos, all through Adobe Connect technology. The school also recommends that students attend one of their MBA events, which provide networking opportunities. The internationally recognized Robert H. Smith School of Business at Maryland-College Park offers a focused and experientially driven MBA program. The program is taught by world-renowned faculty with a hands-on curriculum. Students can choose a broad general business track or specialize in accounting, finance, information systems and business analytics, marketing, or supply chain management. The Smith online MBA allows students to engage in academically rigorous studies while meeting professional and personal obligations. Students have access to audio and video messaging, integrated multimedia and collaborative online workspaces, and live online classes, in which students interact with professors and peers in real time through the video conferencing tool Adobe Connect. Graduates develop expert communication, analytical, and management skills; gain a unique perspective of the diverse business world; hone their leadership abilities; and become well-rounded business leaders. The program requires an opening and closing three-day residency. Texas’ Naveen Jindal School of Management offers a globally focused, part-time, online executive MBA program designed to strengthen students’ analytical problem-solving skills, team-oriented approaches, and strategic planning. The online MBA program requires students to earn at least 42 credits. Courses include marketing management, operations management, science of negotiation, and legal and ethical environment of business. Six elective credits must be fulfilled in classes like advocacy and leadership, new venture creation, and investment theory. Students are given the opportunity to specialize in multiple concentrations, including finance, healthcare management, IT management, innovation and entrepreneurship, international management, leadership in organizations, real estate, and more. Learners have the opportunity to expand their networks and develop specialized expertise. Of the programs 262 educators, 24 have received the university’s highest academic honor. UTD School of Management’s renowned faculty offer students one of the best business degrees in the nation. New York partners with the London School of Economics and Political Science and HEC Paris School of Management to offer a Global Executive MBA program. NYU’s TRIUM MBA provides students with a collaborative and transformational learning environment. Students begin the program by completing an entirely online Immersion and Preparation module, followed by five, 1-2, week-long on-site modules at multiple global locations, including New York, California, London, Paris, and Shanghai. This is done over a 17-month period. Students can concentrate on finance, accounting, marketing, or executive leadership and strategy, while exploring a variety of contemporary topics like global political economy, entrepreneurship, social media, and negotiation. Online MBA learners complete a capstone project, in which they choose a project category and handle their own business idea from inception to launch. The capstone project allows students to explore specific interests. Students create strong connections and build a large network. Students have the option to pursue an MS in global finance, business analytics, and risk management simultaneously. Minnesota’s distance MBA, ranked one of the most flexible online MBA programs in the country, boasts a strong community and network of 445,000 alumni that spans over 90 countries. The program requires two on-campus commitments. The curriculum is delivered through the web-based learning platform Moodle, and consists of video lectures, assigned readings, class discussions, exams, and team projects. Students can tailor their education to meet career objectives while engaging in a variety of business topics, including financial and managerial accounting, strategic management, economics, leaderships, and data analysis. In the second year, learners complete a global experience. Students have access to academic resources, career workshops, and professional conference and case competitions. Minnesota has been accredited by AACSB since 1920, and many of the school’s full-time faculty are internationally renowned scholars and business leaders. Students are allowed to take more than the recommended amount of classes to finish the program quicker. Johns Hopkins offers one of the best online MBA programs in the nation through the Carey Business School. Their part-time flexible MBA has a hands-on career development team and an alumni network of over 200,000 professionals across the world. Foundational classes are delivered in eight-week terms and include business communications and law, leadership and human values, negotiation, marketing and operations management, investments, and more. Students have the opportunity to concentrate in financial businesses, healthcare management, or general management. Electives include fixed income, cybersecurity, power and politics, design thinking, wealth management, real estate, and more. Students have up to six years to complete the degree. The self-paced program accommodates full-time students and working professionals. Faculty members are engaged in interdisciplinary applied research to identify solutions to society’s challenges. The average time to complete the program is 2.5 years. Students must earn at least 54 credits. North Carolina State’s AACSB internationally-accredited online MBA program offers a flexible, customizable education taught by an award-winning faculty. With the exception of two required three-day residencies on the main campus in Raleigh and an optional week-long international residency, the rest of the degree can be completed entirely online. The degree is focused on technology, business processes, and practical applications. Students can choose an area of emphasis in biosciences, financial management, marketing, innovation, supply chain, or entrepreneurship and technology commercialization. Learners can also choose to earn a graduate certificate simultaneously. NC State’s online learning management system, WolfWare, which features Moodle and Blackboard Collaborate, offers an online learning environment integrated with virtual simulations and team-based projects. Distance learners have access to the Jenkins Career Management Center and a global network of peers, faculty, and alumni. The accelerated program allows students to finish the program in 21 months, but they have up to six years. Pepperdine, a Christian university committed to academic excellence and Christian values, was named one of the top 15 best online MBA programs by the U.S. News & World Report in 2016. Accredited by the AACSB, the Graziadio School of Business and Management offers a collaborative MBA. The program can be completed entirely online or in a hybrid format. The hybrid program combines online courses with one Saturday per term class and an in-person weekend Personal and Leadership Development workshop. MBA students can choose an elective concentration in finance, leadership and managing organizational change, marketing, or general management. Students also have the opportunity to engage in a live case study, where they work directly with current industry executives. With discussions in globalization, business competition, technological innovation, and ethics in the workplace, students at Pepperdine develop the critical thinking skills and practical business managerial expertise they need to become effective managers and leaders. Carnegie Mellon’s Tepper School offers one of the best online MBA programs. Students can take multiple concentrations, degree tracks, capstone courses, and global study opportunities. The part-time MBA curriculum is delivered through live, synchronous, interactive learning and independent, asynchronous video learning. Online students complete team-based projects and independent assignments, and have access to Carnegie Mellon’s corporate recruiting support leadership center. Coursework, class materials, archived videos, notes and documents, virtual study spaces, and scheduling tools can be accessed any time. Students attend six, in-person access weekends per year, which are held on campus every two months. Access weekends give students the chance to expand upon a supportive network of professors and peers, and receive an introduction to upcoming coursework and a semester wrap-up. The Carnegie Mellon MBA was ranked sixth among online graduate MBA programs by U.S. News & World Report. George Washington’s part-time professional online MBA offers students a rigorous, world-class education. GW delivers digital courses through Blackboard, enabling students to participate in live classroom discussions, lectures, case discussions, and group projects. Students can choose a maximum of two concentrations in consulting, finance, global management, government contracts, project management, and information systems technology management. Online students complete one, four-day, on-site residency in the District of Columbia, allowing them to experience the Federal Reserve, U.S. Congress, and the World Bank. Online students create their own schedules, decide the length of time it takes to complete the program, and have access to online faculty office hours for real-time contact with professors. Studying at George Washington enhances traditional business competencies, ethical leadership, sustainability, social responsibility, and corporate citizenship. It’s among online MBA programs that can be completed fully online or hybrid, and it’s taught in a cohort format. Babson’s blended learning online MBA program combines online classes and on-site sessions. The program incorporates a startup residence weekend, where students have the opportunity to build their networks and take classes in entrepreneurship and leadership. Throughout the program, cohorts meet face-to-face every seven weeks, usually on the weekends. The rest of the program is delivered virtually through synchronous, real-time discussions. Students also participate in virtual collaboration to discuss assignments and participate in group projects and signature learning experiences (SLE). With SLEs, students engage in complex entrepreneurial problem-solving and decision-making activities while applying their leadership abilities and teamwork skills. Electives include brand management, entrepreneurial finance, global strategic management, negotiations, product management, and more. Students complete a capstone project where they work as a team to develop a business plan, integrating accumulated learning experiences, while exploring their creativity, innovation, and entrepreneurship skills. Mary, located in North Dakota, is a private Catholic school that offers a values-based, professionally-focused MSN-MBA dual degree in healthcare administration. Accredited by the Commission of Collegiate Nursing Education, the accelerated online MBA program combines nursing and business coursework to develop student’s clinical and health care management skills. The program uses Canvas, the online learning platform, to deliver a curriculum from the perspective of Christian, Catholic, and Benedictine values. MSN-MBA students complete a final capstone project that integrates nursing and management theory in a practical application. Coursework includes managerial finance and accounting, strategic healthcare decision-making, and influential nursing leadership. Students must also complete 500 hours of practical leadership experience. Graduates are better equipped to become nursing leaders and ethical decision makers. Applicants must have at least a 2.75 GPA and submit to a criminal background check. With a global network of over 400,000 alumni, 23 of which are Nobel Prize winners, students in Illinois’ iMBA program have the opportunity to engage with special practitioner faculty from companies like Google, receiving perspectives from real-world business leaders. Students have access to an academically rigorous education that combines interactive classes, projects, and live class sessions. Online MBA students complete four, core specialization courses in strategic leadership and management, managerial economics and business analysis, value chain management, and financial management. These core classes develop student’s business and leadership skills, which come together to complete a capstone project. Students choose two advanced-leadership specializations in innovation, digitalization, and globalization. The MBA student body includes students from more than 15 different countries. When students work in virtual study teams, they gain access to cross-cultural experiences and peers with extremely diverse academic and professional backgrounds. Florida International offers an online Corporate MBA (CMBA) and a hybrid Healthcare MBA, both utilize innovative technology to offer interactive, engaging, and academically rigorous courses. The program is designed for working professionals and can be completed entirely online. By specializing in entrepreneurship and innovation, finance, international business, marketing channel strategy, business analytics, or strategic negotiations, students are equipped to become strong and ethical business leaders. Students in the online MBA in Healthcare gain knowledge in financing and reimbursement of health systems, federal and global health policy processes, legal issues facing providers, and effective decision making for healthcare managers. Healthcare MBA students complete 120 hours of residency, earn certifications in Lean Six Sigma yellow and green belt, and have the option to enroll in a global travel program. The global travel program enables students to earn an advanced certificate in global healthcare administration. Accredited by AACSB International, Houston-Clear Lake offers one of the best online MBA programs. Foundational coursework, which includes accounting, statistics, and economics, is delivered through Blackboard. Students must complete a strategic management seminar and capstone project, and can choose a formal concentration in environmental management, finance, human resource management, or management of technology-leadership. UHCL also offers internship and co-op programs, equipping students to pursue higher-earning and key management opportunities and giving them the opportunity to create connections, gain work experience, and expand their professional networks. The school gives online students access to advising procedures and technical support. Students have access to professors with first-hand business and research experience and expertise in finance, international business, general management, human resources, and marketing management. Graduates are prepared for careers as compliance officers, business operations managers, financial managers, medical and health service managers, and accountants. Launched in 1999, University of Baltimore was the first AACSB International-accredited school to pioneer a web-based MBA program. UB’s online MBA is designed for collaborative and strong communicators. Students can customize their program start time and their specific coursework based on their interests and schedules. The program includes required core classes, and students choose between an entrepreneurial or a corporate focus. Classes are offered in a small, 1.5-credit size, and completed in seven-week sessions. The program was developed with current and relevant principles in mind, including innovation and strategy management, leading and managing people, interfacing with external stakeholders, managing value chain, managing performance and risk, and leveraging technology and business intelligence. Students can earn graduate certificates in business fundamentals, organizational leadership, and innovation management and technology commercialization. Distance learners must earn at least 48 credits. Dual-degree programs are offered on campus. La Verne has been producing scholars since 1891. The school offers an online MBA for experienced professionals. Designed around changing management, problem solving, teamwork, technology and globalization, La Verne’s MBA curriculum integrates real-world applications with management theory. Students can choose a concentration in finance, management, leadership, or marketing. Learners will complete a culminating project, which includes a strategic management seminar. Students have access to a professional academic advisor; career services are available to La Verne alumni for life. Distance learners are taught how to craft strategic plans, think with a global perspective, and understand how information technology affects an organization. La Verne MBA graduates become effective future business leaders and professional managers with strong interpersonal and communication skills and a commitment to social responsibility. Students must earn at least 33 credits. Courses include managing technology, business marketing, business finance, and accounting fundamentals. Louisiana State’s online MBA Program is an AACSB-accredited, cohort-based, broad-management focused program. By taking one course per seven-week module, students can complete their MBA entirely online. Courses are taken asynchronously. The curriculum enhances student’s business knowledge, leadership skills, and critical analysis abilities. Core classes include managerial statistics, cost management, marketing administration, and the legal environment of business. Elective coursework includes international management, project management, negotiation, persuasion and influence, supply chain management, and business analytics. Students are assigned an MBA program advisor and have access to career development and job placement opportunities. With a worldwide alumni network of 225,000 members, students are well-connected. The program strengthens students' business core competencies, qualifying them to work in a variety of leadership positions, including healthcare, information technology, human resources, finance and more. Students at Purdue have the opportunity to earn a dual master’s of science in engineering-business administration and a dual master’s of science-business administration. Designed for engineers, the dual degree MSE-MBA program helps students develop the business and management skills needed in the current global economy. Online MBA students begin with an engineering specialization and classes in economics, IT, operations, and quantitative analysis. Then they move onto MBA coursework and take classes such as accounting, globalization, organizational and strategy development, project management, financial management, law, and ethics. The MS-MBA in Food and Agribusiness Management is the only industry-focused graduate program that allows students to continue working while pursuing two degrees. Students enroll in five residencies and complete a final capstone research project. The one-week residencies expose students to global business challenges, while the capstone project enable students to apply classroom material into their real-world work situations. Syracuse’s Martin J. Whitman School of Management offers one of the best online MBA programs taught by award-winning faculty. The program is designed for working professionals with at least a bachelor's degree and one year of full-time work experience. The [email protected] teaches students to be analytical decision-makers. The degree has six specializations: accounting, business analytics, entrepreneurship, finance, marketing management, and supply chain management. Students have access to a virtual career center and personalized career coaching. Learners gain the business knowledge and support they need to advance their careers. In addition to a live platform for online coursework, MBA students attend three weekend, in-person residencies, in the United States and internationally, including one on the Syracuse campus in New York. Residencies enable students to connect with peers, professors and guest speakers, which broadens their networks and heightens their cross-cultural and global awareness, enabling them to gain insight into diverse business challenges. Hawai'i-Mānoa offers the only AACSB-accredited MBA program in Hawai'i. The distance learning executive MBA is designed to strengthen cohort connections and professional networks. Students begin the program with an interactive, intensive five-day resident module near the UH-Manoa campus. The residence weekend includes day and evening classes and helps foster a collaborative learning environment, while introducing students to the core curriculum and current management issues. Students are required to attend 14, Saturday classes held on campus; the rest of the curriculum is delivered through state-of-the-art, faculty-directed, distance education technology. With video conferencing software, classes are broadcast in real time, allowing students to interact with each other, ask and answer questions, and conduct presentations. UH-Manoa also offers an optional health care management track, which combines the MBA core business curriculum with healthcare-focused electives, providing an insight into the health sector. Brandman, part of the Chapman University System and one of California’s oldest private universities, serves adult learners. Brandman’s MBA is designed for working professionals, and the program is taken fully online or in a hybrid format. MBA students receive an education with a focus on sustainability and innovation. Students can customize their programs by choosing an area of emphasis, including accounting, e-business strategy, entrepreneurship, finance, health administration, human resources, marketing, international business, and organizational leadership. Regardless of specialization, all students complete a business strategy and competitive advantage capstone project. The goal of Brandman’s online MBA program is to advance student’s understanding of an evolving marketplace and help them integrate ethics, social responsibility, and sustainability into their decision making. It also aims to teach students the most valuable skill sets that will enable them to become successful organizational leaders. Sales managers lead sales teams. They analyze data to set quotas and goals and assign sales territories to sales representatives who work under them. They also train and provide support for sales representatives. Most sales managers were once sales representatives themselves. This first-hand experience gives them inside knowledge of the sales process, which helps them devise more strategic sales plans. Travel to different sites is also often part of a sales manager's position. Marketing managers generate interest in an organization's products or services by designing targeted advertising programs. To accomplish this goal, they work closely with creative talent in art departments, sales people in marketing departments, and financial staff members in financial departments. Marketing managers usually have prior work experience in advertising, marketing, or sales, and are passionate about promoting their organization's message. In today's app-focused economy, an intimate understanding of social media is also beneficial to the position. Top executives set policies and design strategies to make sure an organization meets its goals. They direct day-to-day and long-term activities by coordinating the organization's human and nonhuman resources. Regardless of personality type, the best top executives are simply responsible individuals who are able planners and think in terms of "we" to promote the interests of the organization.